Compiled by Mrs. Bloomfield Moore. True philosophy, when reached, said Professor George Bush, will conduct us into the realm of the spiritual as the true region of causes, and will disclose new and unthought of relations between the world of matter and of mind. It is these unthought of relations which Keely's system of sympathetic physics brings to light; opening out a field for research which lies beyond the boundaries of our present knowledge. As yet he has been unable to satisfy his own penetrating mind in regard to all the hypothesis which his various discoveries have led him into formulating. He has himself, in his search for truth, pursued the wrong path too often, and made too many errors, not to welcome refutation of them, and acknowledge his mistakes when brought before him. The title which he has given to the latent current of the triune polar flow that he discovered in 1872, "polar negative attraction," undoubtedly conveys the idea that this flow is an agent closely allied to magnetism; but such is not the case. This latent element exists in the interstitial conditions of all nature's triple streams of force; in electricity, in magnetism, in gravity; and is the dominant current in each of these, maintaining a sympathetic relation to the high or compound luminous, which manifests itself when the proper mechanical requirements are used. It is entirely foreign in character to the elements now in commercial use. Researchers will always find before them a limitless beyond, comprehended only by the Infinite One. What modern cosmologists would have us believe was evolved by blind chance out of the inherent potentialities of primordial chaos, this glorious system of spiritual physics demonstrates as dependent upon the relationship between mind and matter; showing whence the initial impulse comes which sets in motion machinery of unimagined complexity, on given lines, toward a prescribed end. Chance, as has been said, is in no sense a force, but merely the sway of a balance of forces already in action. 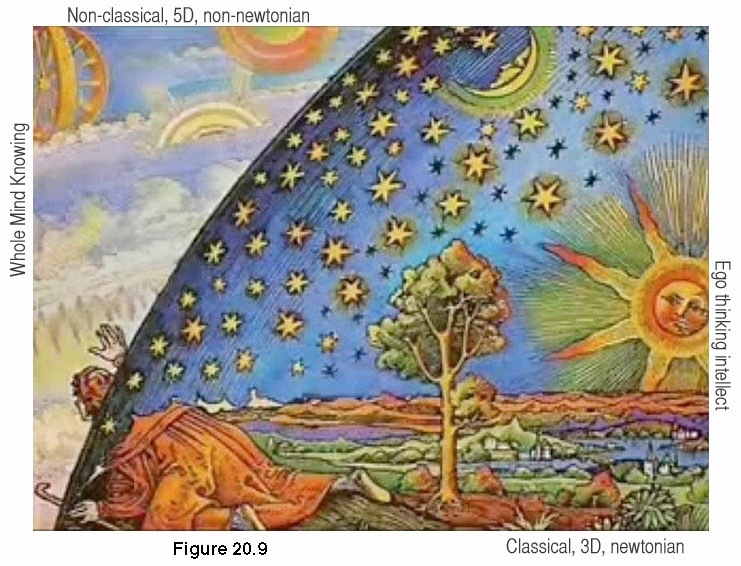 Sir Isaac Newton taught that there is such consistency in nature that what lies wholly beneath the region of visibility may be safely inferred to be similar to that which is gross enough to be palpable to sense; and Keely, reasoning on this line, has copied nature in his mechanical work. "I call this indefinable, latent element," he writes, "the soul of the sympathetic elements in which it manifests, itself; and which until now has been locked up in their interstitial embrace. It is the leader of all triple streams, associated with the polar negative envelope of our planet and the one most sympathetically concordant to celestial radiation. In our individual organisms, the latent soul-forces, existing in the cerebral domain, are sympathetically subservient to the celestial radiating force whereby they are stimulated into action in controlling the movements of our bodies. Take away this latent element from the brain and the physical organism becomes and inert, dead mass; on the same order as a mechanical device without an energy to operate it. "The polar negative machine is a mechanical brain, with all the adjuncts associated with it to sympathetically receive and distribute the polar negative force. Its sympathetic transmitter (corresponding to our sun in our planetary system, transmitting all energy from the central sun of the universe) is the medium whereby sympathetic concordance is established between it and polar sympathy. The requisites for polarizing and depolarizing keep up the action of the machine as long as it is associated with the transmitter. The force which operates the mechanical is the same as that which operates the physical brain; purely mental, emanating from celestial outreach. There is nothing in the range of philosophy which so satisfies the intellect as the comprehension of this wondrous system of sympathetic association, planned by the Creator of the celestial and terrestrial universe, for the government of all forms of matter. "Nature cannot rebel against herself. The flowers of spring cannot resist the sympathetic force which calls them into bloom, any more than the latent force in intermolecular spaces can rebel and remain in neutral depths when sympathetic vibration calls it forth. "What is the soul but life in latent suspension? The motion exhibited in matter shows that its soul is ever present; and yet there are men of great learning, as taught in the schools, who, after spending their lives in researching all forms of matter, deny that all living things depend on one everlasting Creator and Ruler, in whom they live and move and have their being through all time, as much as when He first breathed into them the breath of celestial radiation; and to whom they are as closely allied, still, by the workings of the great cosmical law of sympathetic association, as when the evolutionary work of creation commenced. "The ancients were far better schooled in spiritual philosophy than are we of the present age. Their mythological records, in their symbolical meaning, prove this fact. They recognized this latent element as the very breath of the Almighty; the sympathetic outflow of the trinity of force, the triple spiritual essence of God Himself. Their conceptions of Deity were greater and truer than our own. From them we learn that when God said 'Let there be light,' He liberated the latent celestial element that illuminates the world: that when He breathed into man the breath of life, He impregnated him with that latent soul element that made him a living and moving being." Thus we see that true science has at last - as the result of Keely's half century of research - a sure basis for knowledge, in the resolving of the numerous so - called laws of nature into one universal law, explaining the grandest and most prevailing phenomena of the material universe-phenomena which have hitherto set at defiance all attempts to conceive a mechanism to account for them, and which Abercrombie declared, in his "Inquiries Concerning the Intellectual Powers," to be beyond the reach of the human intellect to explain. By the knowledge thus revealed - for, as Moreau has said, "Knowledge does not come to us by detail, but in flashes of light from heaven," - we realize the truth of Sir John Lubbock's words that "the great lesson which science teaches is how little we yet know;" but we learn also that there are no boundaries to the life of the soul; that the soul is the principle of life itself, the latent element which connects us with the Infinite and Eternal One from whom all things proceed; and that in God's life we live and move and have our being. Vibratory physics, in the great cosmical law of sympathetic association, explains all phenomena of nature, and demolishes the barrier that skepticism and materialism - working together toward a reign of anarchy - had erected between matter and spirit, in proclaiming that the soul dies with the body, that nature rows and steers her own canoe; denying that there has ever been such a thing as revelation, or that there is any proof of design in the works of creation; and teaching that efficient causes are beyond our reach, that we must be satisfied with the knowledge of the facts and their actual connection - as we observe them - without trying to trace the events on which the connection depends. Lord Salisbury recently said of the cloud of impenetrable mystery with which science covers phenomena that she cannot explain: "If we strain our eyes to pierce it, with the foregone conclusion that some solution is and must be attainable, we shall only mistake for discoveries the figments of our own imagination;" but as long as we have men able to guide an intelligent public inquiry, who "have no prejudices except in favor of men who do honest and self-sacrificing work in new fields,"1 there is still hope that Keely's discoveries will command that interest which will save them for science to this age; even though not available to commerce in this century, as is now anticipated. Surely with this new revelation of "unthought of relations between mind and matter," the universe lies before us as a legitimate field of knowledge; where researches will be able to occupy themselves with facts and observations tending to explain and demonstrate the manifestation of the spiritual principle, life itself, without having these investigations confounded with those of mere metaphysicians, who dwell in the region of abstract ideas, and endeavor to reduce them to the clearness of mathematical axioms. Next to being on the right road, the most fortunate thing that can happen to the searcher after truth is to find out that he is on the wrong road. Leaving the central basis and facts of humanity as too vast and unmanageable, science has been working in "the huge, vicious circle" of Comtian philosophy; until, arriving at its farther limit from the center, it has reached, says Carpenter, "the outermost shell, as it were, of the great Mancosmos; and now, to their great surprise, it finds that this shell is not entirely osseous." Savants are forced to acknowledge that, if deprived of one of the crutches which science has been leaning on, natural selection, they have no resource but to fall back on the mediate or immediate agency of a principle of design. Stanley Jevons, in "Principles of Science," expresses his strong conviction that, "before a rigorous, logical scrutiny, the certainly of our scientific inferences will prove, to a great extent, a delusion." If, at this juncture, a physicists could be found bold enough to turn, in the face of dogmatic science, to Keely's system of sympathetic vibratory physics, he would touch the solution of hitherto unsolved problems set down in a language as incomprehensible, to him, as was the language of Dr. Gilbert (the discoverer of electric force) to his compeers; and even more so than that of Faraday, of whom the same complaints were made, in his writings, wherein he differed in opinion from his colleagues. Says Lord Kelvin, there is a still greater mystery than any which is to be found in connection with any physical science, and that is the mystery of the human will. Celestial Radiation unveils this mystery. The cosmical law of sympathetic association gives to science an atom that will suit the requirements of both chemist and physicist. The ether hypothesis of vibratory physics answers as well for the vehicle of gravitation as for the vehicle of light; and is equally available for gravity, electricity, and magnetism. If men of science fail to comprehend the terms which Keely has had to coin, the language in which he has done his best to convey to them his meaning, the great book of nature lies before them - available to all - from which he has gained his knowledge of the divisibility of the atom, of latent force in all interstitial spaces, and of the governing law of sympathetic association. He has put together, in regular method or order, full and connected hypotheses of the operations of these laws of nature in the system which, if incomprehensible and unworthy the attention of "The Lights of Science," will not be so at the end of this century of progress; should its crowning achievement be that of solving the problem of Aerial Navigation. Some individuals, says Colquhoun, may be more, while others are less, capable of deciphering the characters in which the book of nature is written, and of comprehending and duly appreciating the truths it reveals. But, if we would peruse it with advantage, we must shake off all prejudices and not cling to preconceived notions. The skepticism of science repels, with too much contempt, the investigation of phenomena which it deems impossible or inconsistent with its cherished systems. There are no barriers so detrimental to the progress of real and useful knowledge as the prejudices of self-satisfied and exclusive men of science. Buffon, treating of the sympathies that exist between the different parts of the living organism, censured medical men for not examining their correspondences in the human body, upon which depend a great part of the play of the animal machine. "The true springs of our organization," he said, "are not these muscles, these arteries, these nerves, which anatomy describes with so much care and exactness; there are internal forces which do not follow the laws of that gross mechanical system which we have invented, and to which we would reduce everything. Instead of attempting to attain a knowledge of these forces from their effects, men have endeavored to banish even the idea of them, and to exclude them from philosophy. "The ancients, whose genius was less limited and whose philosophy was more extended, wondered less than we do at facts which they could not explain; they had a better view of nature, such as she is: 'A Sympathy,' a singular correspondence, was to them only a phenomenon, while to us it is a paradox, when we cannot refer it to our pretended laws of motion. Let us, with the ancients, call this singular correspondence of the different parts of the body "A Sympathy," or, with the moderns, consider it an unknown relation in the action of the nervous system; this sympathy, or this relation, exists throughout the whole animal economy, and we cannot too carefully observe its effects, if we wish to perfect the theory of medicine. Much might be discovered, if the most eminent physicians would turn their attention to the study of this relationship, more useful, perhaps, than the nomenclature of anatomy. "The medical student applies himself to the indispensable study of the mere animal mechanism, and to the uses and functions of the material structure, which is essentially necessary: - also he studies chemistry, materia medica and pathology; but the success of professional practice depends upon the skillful application of a profound knowledge of the various sympathies and susceptibilities of the human frame: - its capability of being affected in various ways, by those imperceptible physical and moral influences whose existence is constantly manifested in the lifting body; but which we should in vain attempt to detect or trace in the inanimate subject. Yet men of science betray an obstinate skepticism with regard to the result of all such inquiries, and a propensity to call those physicians "quacks" who are engaged in them. Until their researches are extended, in this direction, medicine can never become a science; it must remain an art. Van Helmont was fully aware of the powerful influence of the mind on the body; but since his day few eminent men have studied the sympathies existing between the different and distant parts of the animal economy, through the mediation of the nervous system; and those who have, like Dr. Alison and Dr. Monro, arrived at different conclusions regarding the possible source of this sympathy. If the nerves have cavities, as has been surmised,2 these mutual sympathies are easily explained on the ground that they secrete and transmit some substance. "Whether the nervous system be intended to serve other purposes in the animal economy, it is certain that it is intended to serve the grand and essential purpose of maintaining the connection between mind and body. Whether these sympathetic actions originate from a connection between the different nerves, which are the sole instruments of all sensations; or whether they are determined by mental sensations; these are questions to be decided by scientific physiologists and physicians." By combining physical physiology with mental, a path is opened in Keely's discoveries for the solution of all problems in this field of investigation. The late Professor Zerfi held, with Dr. Bertrand, that the plexus solaris performs the same functions in relation to the internal life that are ascribed to the brain as the organ of the intellectual faculties (in the waking state) in relation to the external life. The ancients called the solar plexus the cerebrum abdominale; believing that the soul derives from it the materials necessary for the formation of its intuitive judgments. "We have yet much to learn before we are able to comprehend the wonderful operation of the imperceptible agents of nature, and of all the instruments we can employ," says de La Place (the disciple of Newton) "the nerves are the most sensible; especially when their sensibility is exalted by particular causes. It is by means of them that we have discovered the slight electricity which is developed by two heterogeneous metals. The singular phenomena which result from the extreme sensibility of the nerves, in some individuals, have given birth to various opinions relative to the existence of a new agent, which has been denominated animal magnetism, also to the action of terrestrial magnetism; to the influence of the sun and moon in some nervous affections; and to the impressions which may be experienced by the proximity of a metal, of running water. It is natural to suppose that the action of these causes is very feeble, and that it may be easily disturbed by accidental circumstances; but, because in some cases it has not been manifested at all, we are not entitled to conclude that it has no existence. We are so far from being acquainted with all the agents of nature, and their different modes of action, that it would be quite unphilosophical to deny the existence of the phenomena, merely because they are inexplicable in the present state of our knowledge." The lines of research pursued by the eminent physicists, William Crookes and Oliver Lodge, have brought them to the same conclusion that Camille Flammarion has arrived at in his studies, viz., that certain natural forces exist of which humanity is ignorant; which makes it the more remarkable that they have not been able to find time to examine into Keely's demonstrations of the power of will force in machinery, under given conditions. Raoul Pictet, the learned Swiss physicist whose researches in low temperatures (in the very domain of sympathetic vibratory physics) have brought him out of the "impenetrable cloud," in which materialistic science has wrapped the mysteries of nature, into the light of religious science, after listening to a "wholesale" condemnation of scientific research from a Roman Catholic Bishop, said to him: "Have you ever seen God?" "Of course not," the Bishop answered. "Then I have this advantage as a researcher of truth over theologians," replied Professor Pictet, "for the longer I study the phenomena of nature the more distinctly I see God in all of nature's operations." When Edison was asked: "Do you believe in a personal God?" "Certainly," he answered, "the existence of God can, to my mind, almost be proved from chemistry." "The reason of skepticism and unbelief is not to be wondered at," writes Thornton, "when men interested in scientific research find no evidence, from their experiments, of the presence of God in the Universe. How could this be otherwise? God has to man but a subjective existence, which could never be reached by any known mode of experiment; therefore man must get outside of himself, which means that he must 'die' to know God and the reality of things. "In the creative power of intuition we must look for a knowledge of what is called the supernatural; and in this alone we have the evidence of infinity; to which inventive genius can testify, as intuition creates those things which have no material existence. The infinite power of God creates a thing, without previous existence, by command; and man brings into existence, through material, that which his intuition creates. Intuition is the only possible source that could furnish us with the ability to formulate mentally an absolutely unconditioned ego. In fact, absolute knowledge can never be obtained outside the sphere of intuition, for which we are indebted to the gestation of thought. Relative knowledge belongs to experience as well as intuition. The law of heredity teaches that mental and morphological impressions are transmitted to the offspring from the sexes. In the same way intuitions arise from the gestation of thought, the continuity of which is transmitted by the same means, and for which we are indebted not only to our parents, but to all our progenitors. He who possesses genius can emit coruscations from the gestation of thought which are the evolutionary flashings of a spiritual essence." ["Origin, Purpose and Destiny of Man," by Wm. Thornton]. As a subject which does not admit of verification by the prescribed canons of mechanical physics is held to be unworthy of attention, as untenable, it is fortunate for the cause of humanity that modern science has reached its ultima thule, where the tide of materialism must set back and carry with it the drift-wood of skepticism which has been accumulating during this century. To quote the words of a physicist (at the Forest Gate Physical and Chemical Laboratories), "The door, between us and the spirit-world, which it has been declared is shut and bolted is even now ajar and a few gleams of light are struggling over the threshold from Keely's discoveries." The artificial beacon, fed with the oil of learning, so proudly held aloft by modern science, is flickering; and many great minds are rebelling against the darkness in which it has plunged the mysteries it sought in vain to unravel. The Popery of scientific authority must have its downfall now that researchers after knowledge are making a stand and contending their right to think for themselves, instead of allowing dogmatic science to decide for them. There is a light which sympathetic physics teaches us will never fail: - the inner light, or intuition, if we seek its guiding rays. The Spirit of Truth will lead us into all truth is the promise given by One who spake as never man spake before; and, with the foundation stones of pseudo-science crumbling away, there is nothing left to fall back upon but the fortress of Revelation. "In the beginning was the Word (Logos in Greek; the divine principle of Truth, of thought, intelligence, knowledge) and the Word was God. In Him was life, and the life was the light of men. And the light shineth in darkness and the darkness comprehendeth it not." With revelations fitted to their growth,"
instead of rejecting what seems to advance thought to be "a fuller revelation of revelation" (suited to the needs of our age) because of the obscurity of the language used by Keely, would it not be more rational to accept Professor Pierson's views? viz., "the very fact that there is, about the product of another's genius, what you and I cannot understand, a proof of a superior order of faculties." No one who has ever conversed with Keely, in an unprejudiced spirit, has denied that he is a man of genius; and, unintelligible as his writings may be, in the present state of our knowledge, the time will come when they will be as well understood as are the writings of Gilbert and Faraday now; for commerce will be able to accomplish what science refuses to do; and journalism is already extending "a helping hand," since it has been announced that Professor Lascelles-Scott thinks Aerial Navigation will be the fait accompli of the Victorian era, as the result of Keely's discovery of the force foreshadowed by Faraday, by Newton, and by Kepler in their writings, as "a force of nature, still unknown, more general and more powerful even than electricity." This force may be in more senses than one "the force of the future;" for, until the current now harnessed has been connected with some patentable device, commerce will not come to the rescue; and unless a more general public interest is awakened, than has yet been manifested, Keely's system of vibratory physics may have to await a more enlightened inquiry from influential quarters. A distinguished physicist, who is himself an independent researcher, writes; "I am afraid that making things known to the public does not advance truth much. They will soon enough run after what pays them. I should have thought that, at the present stage, 'They also serve who stand and wait,' was a safer motto than 'Cry aloud from the house-tops,' If Mr. Keely be perfecting his machine, having, as I understand, practically completed his experimenting, surely it is a time for waiting patiently for the results of his labors. However, it is presumptuous and absurd of me to be writing of these things. I know much too little of the circumstances to do more than make suggestions in order to get information." The extreme simplicity of this system, its conformity to nature, and its capability of affording an adequate and satisfactory explanation of the most important phenomena of the universe, upon one common principle, entitles it to receive the attention of all independent thinkers who feel an interest in the discovery and dissemination of scientific truth; and who, dissatisfied with the complicated structures which modern science has reared upon a variety of gratuitous assumptions, seek to withdraw that veil (hitherto deemed impenetrable) which has long shrouded some of the most important secrets of nature, and concealed from our knowledge the operations of the most god-like element in man, the human will. 1 Mr. Arthur Walter of The Times. 2 "Is there something within molecules independent of them that is the home of life, mind, and soul? We find the most complete telegraphic system in the body; does it contain no resident nerve fluid to fit it?" Hemstreet. 3 Happily, since this paper was written, the current of force has been connected with the operation of machinery, other than the wheel which harnessed it as it were; and Keely is now preparing to demonstrate the result to a committee of expert engineers, who will soon report upon the commercial value of this costless power. What science has rejected, commerce will now be eager to accept, when Keely has demonstrated "a sympathetic force of Outreach representing, in the full circuit, an accumulation of gravital or polar sympathy of more than twenty-three tons per minute." "This is no fairy tale," Keely writes, "but an accomplished fact, capable of being fully demonstrated," to the committee.